With a weekly print audience of 427,000 the TES is the place that active and passive job-seeking teachers turn to, week after week to look for a job. With a weekly print audience of 371,0001 the TES is the place that active and passive job-seeking teachers turn to, week after week to look for a job. 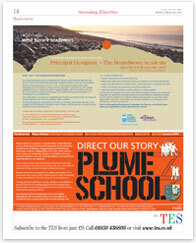 2pm on Monday the week of publication date for adverts to be set and styled by the TES. Verbal bookings by 4pm on Monday prior to publication date for adverts supplied by Quickcut or as PDF via email. To be received by 10am on Tuesday the week of publication date for adverts supplied by Quickcut or as PDF via email to artwork@tes.co.uk. Tuesday at 10.30am for adverts being published on the Friday of that week. By email or fax by Tuesday 10am for advertisements due to be published on the Friday of that week. Other pages: 330 x 260mm. Quickcut artwork delivery system is the preferred method of receiving both mono and colour digital copy and allows you to retain the best control over your advert, however we also accept PDF via email to artwork@tes.co.uk. We do not accept files in Microsoft Office or Publisher. All fonts must be Postscript Type 1 and embedded within the file or they will be re-formatted using TSL licensed fonts. CMYK ONLY. No RGB. No pantone. re-formatted using TSL licensed fonts. 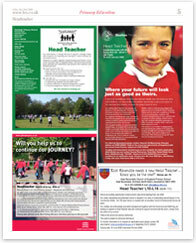 Why advertise in the TES? Upgrade your vacancy on tes.co.uk and make the most of our average weekly online audience of 246,000. 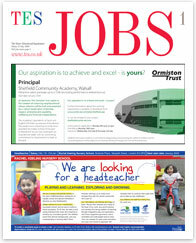 If you send your advert by 4pm Friday prior to publication, we will proof it free of charge. Call 020 3194 3050 to find out more. If you don’t fill your vacancy after the first advert we’ll give you 15% off a second advert and then continue to run it for free until you find the right candidate.